The goalkeeper has signed on an emergency deal until the start of January. 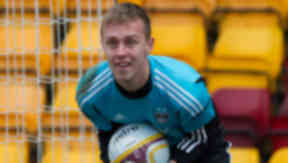 Motherwell have signed Dundee goalkeeper Dan Twardzik on an emergency loan deal and the 22-year-old could make his debut in Saturday's game with Ross County. The former Aberdeen goalkeeper has joined on a short-term deal until the start of January following injuries to the Steelmen's leading shot stoppers. Lee Hollis has been out since the start of October with an ankle injury while Gunnar Nielsen picked up a knock against Celtic. Now Stuart McCall must decide whether to put Twardzik or U20 goalkeeper Ross Stewart for the weekend's game in Dingwall. Motherwell sit fifth in the Scottish Premiership table with 25 points from 15 matches. The Lanarkshire side head into the match on the back of their 5-0 defeat at Fir Park last Friday.